This year, all of us at Adventure Unlimited are exploring the idea of what it means to live generously – to live with a clear sense of the abundant good God provides. Rusty Signor has spent the last five decades living and loving Adventure Unlimited. He was a camp counselor starting in the late 1960s, helping in everything from corral to mountaineering to assistant ranch manager and instructor. He also was a full-time chapter adviser in Colorado and has served on the Board of Trustees. In gratitude for his nine-year term on the National Alumni Board completed in October (his second stint on the NAB! ), we recognize here some of the many ways Rusty has lived generously with the organization. Rusty has “retired” from official Adventure Unlimited service duties – of which there have been many – but he continues to live generously with the organization. He makes hundreds of calls to alumni to draw support for programs and reunions. His giving ranges from picking up the tab for the recent National Alumni Board (NAB) dinner in Denver to joining with a few fellow donors to complete the funding needed for a new horse care barn at the A/U Ranches. Rusty also recently volunteered with the Rainbow Valley Resource Network’s program at the A/U Ranches’ 100 Elk Outdoor Center. He explains his generosity toward Adventure Unlimited and his many friends this way. “I have been on my own since I was 16. I went to six universities, and I have no college friends because I was working full time,” Rusty says. 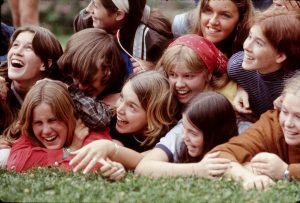 “All of my dear friends are from my camp days. 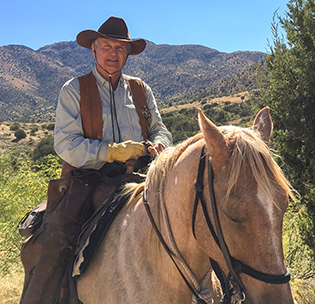 Since that first summer at Sky Valley Ranch, Rusty has served the A/U Ranches and its chapter program (now DiscoveryBound) in many capacities. Most recently, he finished his ninth year on the National Alumni Board (NAB) and also served three years as a trustee. Doug Moser, an A/U Ranches alumnus and resident of Buena Vista as well as new NAB member, remembers when he, as an eight-year-old camper, had a healing with Rusty as his counselor. “At camp, I really wanted to climb a fourteener, but I was not allowed because I was not 10 years old yet. Rusty gave me a chance to prove I could do it by making me carry a heavy backpack around camp, and up to Harvard Lakes,” recounts Doug. “This was a wake-up call. I was healed and was able to peak the mountain. Fifty years later, I met Rusty again – but I had never forgotten him!” Doug says happily. Today they are great friends, and see each other periodically when Rusty stays in his second home in Buena Vista. Another alumnus, Don Gregory, remembers when he was healed by something Rusty said. “In 1967 I was brand-new to Christian Science,” he relates. “I was about to embark on a 50-year career connected with horses, but right then I needed direction and to be grounded in Science. I got both these at the A/U Ranches that year, where I was told this story. Rusty continues to touch lives of his fellow Adventure Unlimited alumni in many ways. One of the highlights of his year, for example, is calling friends during the Christmas season, many of whom he met at camp or while serving on the Board of Trustees or NAB. Since Rusty grew up on a ranch in Texas, Cap Andrews thought it natural for him to work in the corral during the mid-1960s. But Rusty was a jack-of-all-trades and willing to do almost anything. During Rusty’s early days with Cap, he worked in the corral and as a ranch hand. This led him to establish a corral training program from 1991 until 2005, as well as create a mountaineering training program from 1988 to 1990. Cap even asked him to come into Denver to be the first full-time A/U Chapter adviser of the Denver chapter, where Rusty brought his trademark enthusiasm and energy. “Cap kept moving me around doing many things,” he says, including hosting dozens of camp shows in Austin and taking five trips canoeing in the Canadian Boundary Waters. Rusty’s capacity to give has spanned the decades. In his life outside of Adventure Unlimited, he runs a construction business in Texas, is active in his local branch church and is a happy grandfather. He’s drawn on the renovations of Washington, D.C., Seattle and Houston Christian Science churches – where he has friends from Adventure Unlimited – as a model for his work as project supervisor for the building of Third Church of Christ, Scientist, Austin. And he’s been a Christian Science chaplain in a youth detention center for 25 years. From all the Adventure Unlimited alumni out there, we are grateful to you, Rusty Signor, for your life of service and generosity. Thank you. Great inspiring article about “Mr. A/U”, the life changing impact of A/U and the worthiness of our support.